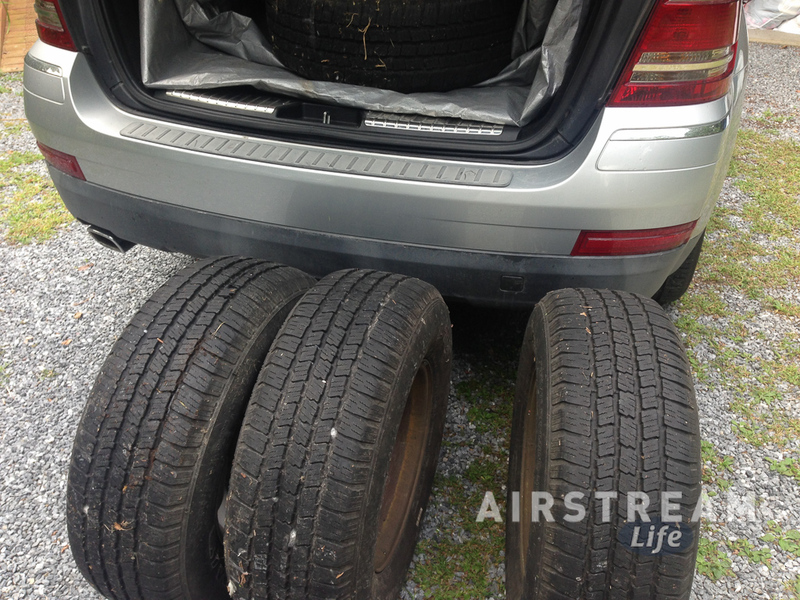 This week I bought the Airstream Safari a new set of tires. There wasn’t anything wrong with the old tires, other than being old. The tire industry makes various recommendations about replacing tires—I’ve heard anywhere from 4 years to 10 years, and the length of time seems to correlate with the confidence the manufacturer has in its product. In this case the tires were Michelin LTX that we installed in January 2010, and although the tires were only used for five years and eight months, they were manufactured in late 2008 and early 2009. Tires begin to age from the day they are made, not the day they are installed, so I considered these to be nearly seven years old. That didn’t bother me much, but on close inspection some fine “checking” (which is the tire industry term for cracking at the surface of the rubber) was apparent. Since my Airstream, livelihood, and family all depends on safe and reliable operation of these tires, it seemed like the time to swap in a new set. In a way, the Michelins have been an experiment. Those of you who have read my blogs from 2005-2010 know that we historically had terrible results from using ST (Special Trailer) type tires on the Safari. After years of constantly replacing them because of on-the-road failures, I took the advice of Andy Thomson at Can-Am RV and installed the Michelin LTX instead. As always, Andy was spot-on with his advice. We’ve never had a problem since. 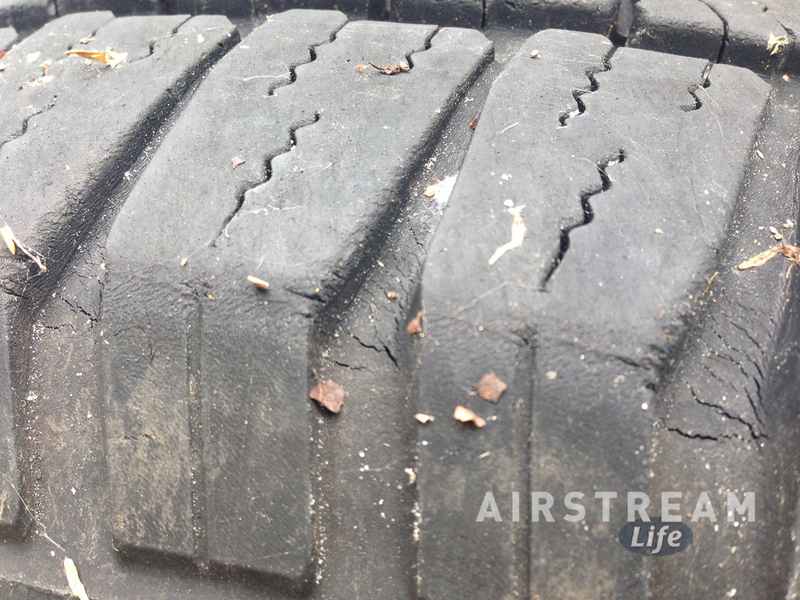 Those tires have traveled over 45,000 miles and the tread is still good. Not one tread separation or flat, whereas I was accustomed to dealing with a problem every few months when I was trying various brands of ST tires. In other words, the Michelin experiment was a success. 235/75 R15 = the size of the tire. My Airstream came with a Goodyear 225/75, so the Michelins are just a little wider. R15 means they go on a 15″ wheel. The speed rating went up too: “108T” means now we can theoretically tow at 118 MPH, as long as we keep under 2,208 lbs per tire. Sounds like fun. I don’t hesitate to recommend these tires to my friends who ask for advice, because I’ve had this very good experience. But if you are happy using some other tire and having no problems, I don’t see a need to switch. Our 1968 Caravel does very well on ST tires, probably because it covers relatively few miles and is a much lighter trailer. Now, having said all this, I’ve exposed myself to a small controversy. Some people like to debate this subject—and many others, such as tow vehicle choice—and undoubtedly one of them will either get in touch with me to inform me of my poor choice or open a thread on an online forum somewhere to discuss it. I have been intrigued to study the reasons why this continues to happen. It’s perhaps oversimplifying, but I see two basic groups in every perennial online towing debate. On one side you have what I’ll call the Rationalists. They look at the numbers and the guidelines. If, for example, the industry says that ST tires are engineered specifically for the needs of travel trailers, with reinforced sidewalls and special tread designs, that’s what the Rationalists will go by. After all, that’s what the experts say—and who are we to second-guess the engineers and the RV industry? They are the ones who made the things! Using LT or P tires is a sort of “off label use,” which might open you up to liability if something bad happens. And finally (say the Rationalists) just because those tires work for a few people doesn’t mean they’re a good idea. On the other side you have the Empiricists. They look at actual experience, and argue that it has more value. If hundreds or even thousands of people are using LT or P-designated tires with a much higher success rate than the ST tires, who cares what the industry claims? Clearly their claims have been disproved by reality. This brings into question the industry motivations for steering us toward an inferior product (perhaps it was because the RV industry loves a low price? or perhaps to maximize profits? ), which leads to deeper suspicion of industry guidelines. Usually, both the Rationalists and the Empiricists firmly believe they are right, and they’ll often defend their position to the point of spoiling a party. (I used tires as an example, but the real fireworks get started over tow vehicle choice.) The problem is that neither side really has all the data. The Rationalists don’t really know if the information they have received is correct. They’re just trusting what they see as the most authoritative source, and as we know, seemingly-authoritative sources can be dead wrong, biased by economic considerations, or distorted. The Empiricist can’t prove the validity of experience without a statistically valid survey. They’re just trusting what they’ve learned anecdotally. Neither side can definitively disprove the claims of the other, so the debate never ends. Both sides will occasionally invoke the mythological concept of “common sense”. There is no common sense related to complex decisions like tow vehicles or tires. You might think that over time, a consensus would emerge from the Internet based on an averaging of real-world experience, but it’s no more reliable than standing in the middle of a stadium and asking everyone to tell you which football team is best. Another favorite argument is the “laws of physics”. Nobody ever explains which laws of physics (Newton, Bernoulli, Avogadro?) they are invoking. Since there are many physical laws and the dynamics of towed vehicles involve many of them at the same time, I suspect that really the claimants are speaking of an imaginary law that says everyone must agree with them. Since nobody knows everything, it’s easy for one side to introduce doubt into the other side’s argument, by suggesting possible (and unprovable) reasons why their position has a fatal flaw. 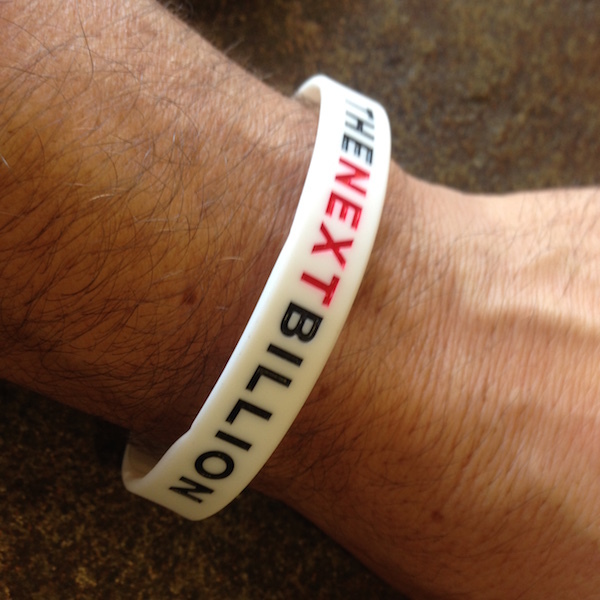 Often this takes the form of suggesting a hidden liability or potential negative outcome that has been rumored. This puts your opponent on the defensive, but beware, because both sides can play this game. So my advice to people who get all worked up in debates about tow vehicles, tires, catalytic heaters, running the propane while towing, and other similar subjects is simple: remember why you got into Airstreaming. I’m guessing it wasn’t so you could argue with other people. Anyway, you’re probably both wrong. Go camping and forget about it! This has been a great summer so far. It started (as it always does) with towing the Airstream up to Ohio for Alumapalooza, and it has been a series of great experiences ever since. Visiting friends in Ohio and family in Vermont, motorcycling through the Adirondack Park in New York, camping in an Airstream Interstate, hiking to ancient ruins in Navajo National Monument, attending the International Rally in New Mexico, attending EAA’s Airventure in Oshkosh Wisconsin … and in between, little TBM activities like The Loft’s “Mondo Monday” and card night with the guys. Last weekend I got a bonus TBM activity. Tesla Motors was in town doing a promotion about Tesla owners having driven over a billion miles on electricity alone, and I took the opportunity to snag a test-drive in a Tesla Model S 85. I won’t go into full fanboy raving about the Tesla here, so suffice to say that it was every bit as awesome as I expected. If I had the funds I’d buy a Tesla Model S right now. But I’ll have to wait for the less-expensive Model 3 to come out. 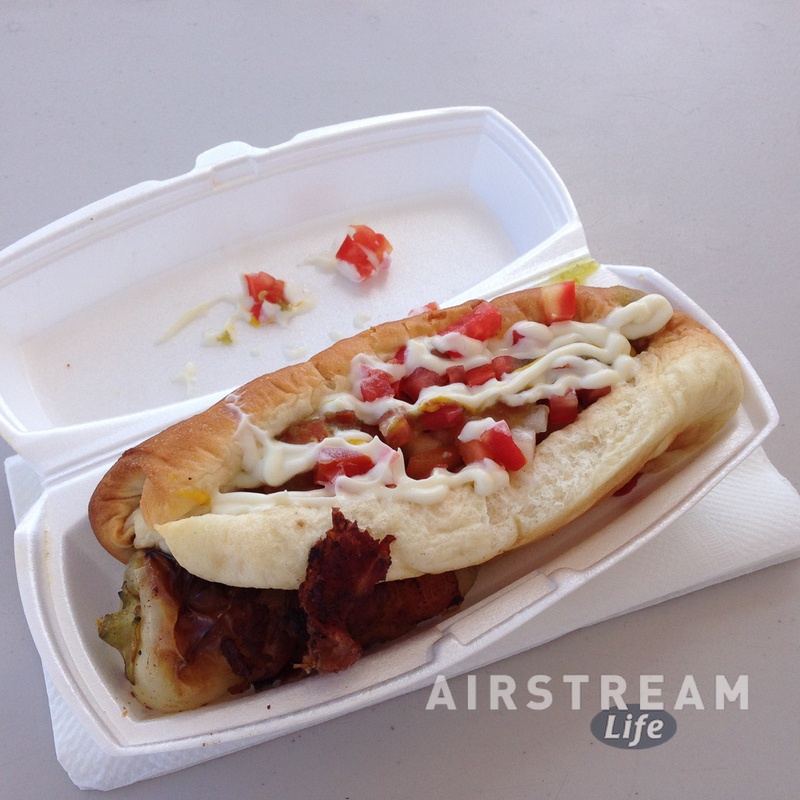 A $2.50 hotdog is more in my price range at the moment. 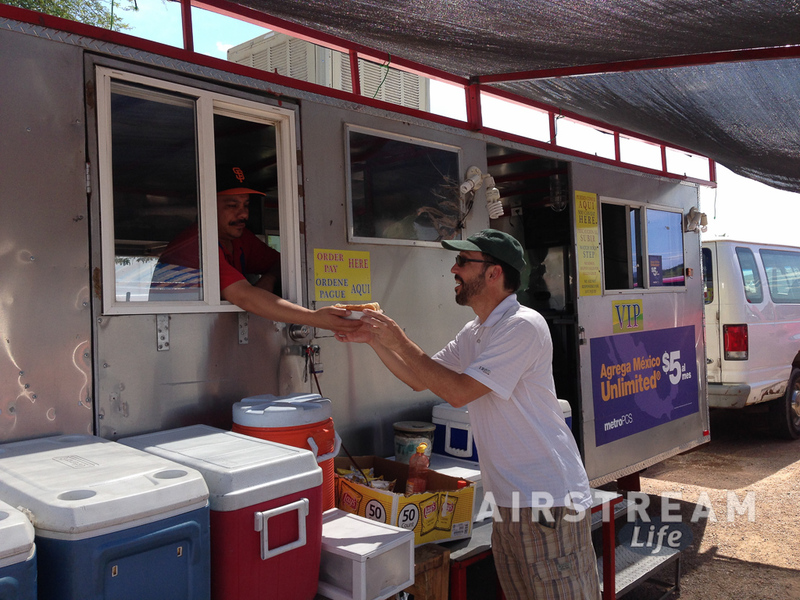 Having been in Tucson on-and-off for several weeks, it was high time to seek out the Sonoran hot dog carts that occupy vacant parking lots along Tucson’s streets. You see, a Sonoran hot dog is a one of the two excuses I allow myself each year to consume a hot dog. The first instance is at a beach party on Lake Champlain in the summer, when friends bring over quirky variations on hot dogs from their hometowns in New York state. Malone NY, for example, has a dog known locally as the “Malone Red Hot“. Rochester and Syracuse have their “white hots“. Burlington VT is the home of the McKenzie Natural Casing Frank, which is hardly exotic but definitely my favorite. Such a variety mandates that one make a dietary exception and explore the local eats. It is made a far better experience when standing in a cool breeze on the rocky shores of Lake Champlain at sunset with a gang of friends and a beach fire. The second exception is in the peak of Tucson’s monsoon season, July through September, when the weather gets hot & wild and people retreat to their air conditioned spaces. I like to roam the main boulevards and seek out those hardy vendors who have staked out vacant lots on prime corners, and maintain their position through the scorching summer and torrential thunderstorms. You know that anyone who keeps their hot dog stand going through such a season has something more important to vend than the average fairground hot dog. These culinary outlets tend to be just a large hot dog cart with a nearby tent, a few chairs and tables, and—if you’re lucky—an old concrete slab from some long-ago demolished house to serve as a floor. Otherwise you’re usually standing on dirt. Traffic from busy main streets is ever-present. There’s no relief from the heat, and only a small patch of shade. But it’s Tucson, so there’s also a good chance that you’ll have a view of the beautiful Santa Catalinas as you eat, and the guy who serves your Sonoran dog will certainly speak Spanish as his first language. He won’t kowtow to you, he won’t B.S. you, and he won’t give you anything but his best. In other words, the experience is wonderfully authentic Tucson: real food served in real outdoor atmosphere, no theme-park imitation anything. It’s an ephemeral experience too: vendors come and go over the years, the locations may change as vacant lots get redeveloped, and even the recipes change like language with little flairs and flourishes added by each Sonoran chef. These days there are at least half a dozen well-established Sonoran hot dog stands around Tucson, and probably another handful that come and go. If I only sample one per year I’ll never get to them all, so I chose two to compare (and brought a friend to help consume them). 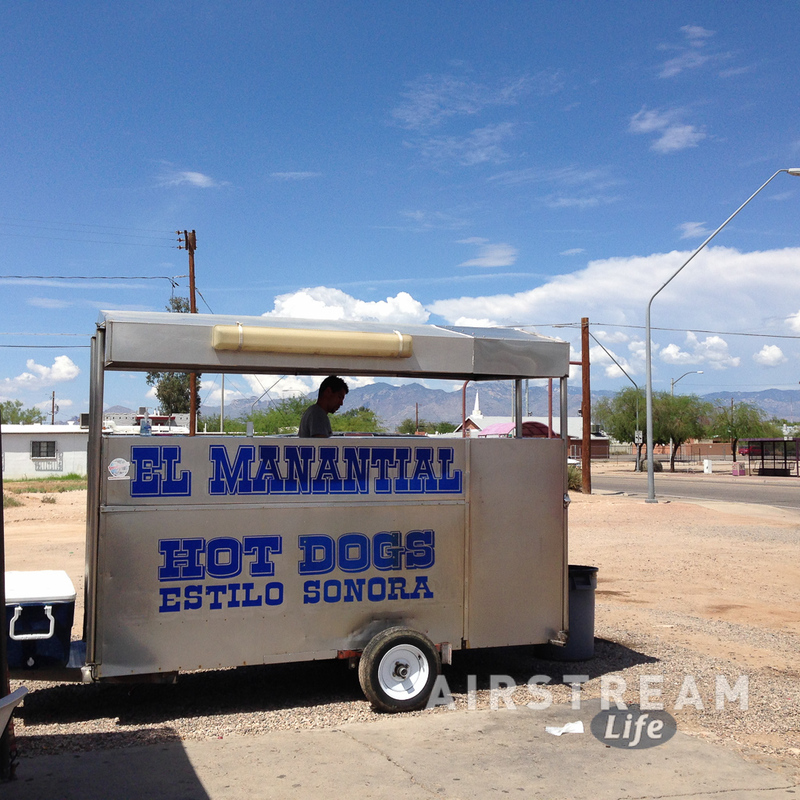 This year I went to El Manantial at Park and 36th in South Tucson, and Ruiz at 22nd and 6th near downtown. Sonoran dogs really aren’t all the same. 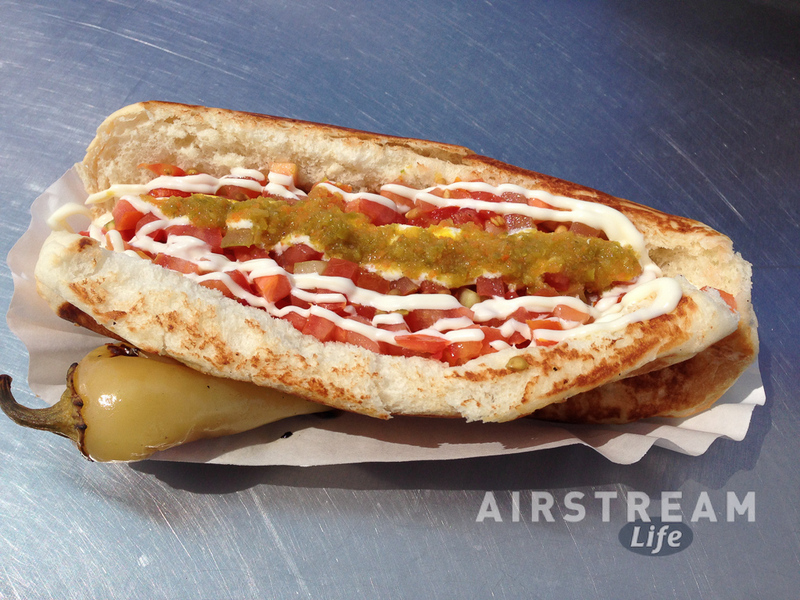 El Manantial (pictured above) tended to put more mayo on the dog, and their guero pepper (served on the side with most Sonoran dogs) was wrapped in bacon and filled with gooey orange cheese. This was like the one I got from El Sinaloense in 2012. Plenty of beans were inside, and lots of diced tomato and onion. A “Mexican” Coke in a glass bottle is always available at these places if you want to have the full culinary experience. These hot dogs should come with a Surgeon General’s warning. The cardiac consequences should be fairly obvious if you include them as a regular part of your diet, but what isn’t immediately apparent is how filling they are. They aren’t large, yet splitting two dogs left me feeling like I wouldn’t want to eat again for a day or two. To be fair, I did eat about 2/3 of each one (because my helper was a lightweight) and my grease tolerance isn’t what it used to be, so I suppose a hungry 23-year-old wouldn’t have the same reaction. Still, you have been warned. We wanted to get some gelato afterward, but neither of us could actually make room for it. 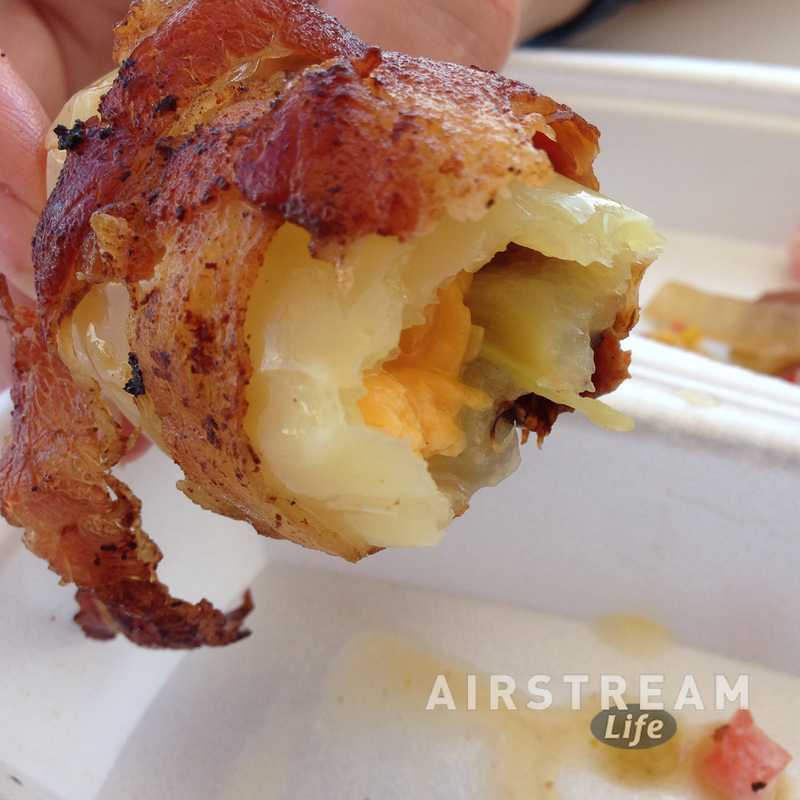 OK, so “eat a Sonoran dog” is ticked off my TBM list. Tomorrow marks the end of my Temporary Bachelor Man time. I’m flying back to New England to rejoin my family and watch the last couple of weeks of northern Vermont summer. It’s a short season up there, and by mid August the days are already noticeably cooler. Residents will be frantically working on their summer bucket lists: get in another day of waterskiing, hike another mountain, ride the bike, have dinner on the patio, etc. In just two weeks we will start to see the first hints of fall color in the maple tree leaves, and by September Vermonters will be sighing as the breezes turn cool and the lake begins to get too wavy to leave the boat moored. We’ll watch the curtain slowly draw on Vermont’s summer, but happily it won’t be over for us. In October we will be taking most of the month to travel back across the country with the Airstream. That’s one of the nice things about this lifestyle—we can extend the season by “chasing 70 degrees” southward in the fall. Summer lasts longer when you’ve got an Airstream. We’re having a great one; I hope you are too.